But the scientists and their families have survived. Lars Nordis is one such scientist, and he and his young daughter Dessie and brother Dard live in a ramshackle farm where they in turns starve and freeze. Lars holds scientific secrets, and he makes Dard memorize a series of numbers, although he won’t tell Dard what the numbers mean. I believe Dard and Dessie are synethsetes of some sort, and do wish that had been explored more. After a raid by the Peacemen that destroys their home and kills Lars, Dard and Dessie have no choice but to find the rumored underground scientists who Lars has been doing work for. Dard finds them, and after helping them defend their hideouts from the Peacemen, they happily accept Dard and Dessie into their group. But what of the formula Dard memorized? What does it mean and who is he supposed to give it to? This is where the story got really good for me. The scientists are so desperate, they are willing to take incredible changes to leave planet Earth. They have built a spaceship and plan to escape Earth and find a new home. But the risks loom large. The long sleep formula might not work. The formulas stolen from an enemy “Voice” (computer) might not be correct. The ship might get hit by an asteroid. They might run out of fuel before finding a suitable planet. But still, they go. With high hopes, they risk everything they have, including their families, for a slim chance of finding a new place to live. If Earth doesn’t want them, they will take to the stars! Trusting that this is their only choice, the smattering of scientists and their families board the ship and go into long sleep. If they do ever wake up, will it be near a planet humans can survive on? Norton’s novels and short stories often featured a young person thrust into new and dangerous situations, forced to come of age when they feel like an outsider, and The Stars are Ours has a similar feeling, and sometimes doubly so. This is a quick read, and helped along by her light and fun style of writing and dialog, you could easily read The Stars Are Ours! in one sitting. Thanks to some super cheesy cover art it’s not too much of a spoiler to say that for the most part, the humans do survive. They do find a suitable planet to attempt to live on. But are they sharing the planet with anyone? The “exploration of the alien planet” scenes quickly became some of my favorites. Pure adventure and exploration, every tree, every creature, everything they find is brand new. How to classify things? What to name them? Are they poisonous? Can we eat them? What happened in these ruined farms and cities and these patterns of lines and colors that must mean something? The scientists are in heaven, and as this is more a science fiction adventure story, Norton keeps everything light and fun. It was when Dessie meets one of the natives that I began thinking perhaps this planet sounded familiar. The shy, aquatic humanoid creatures Dessie names “sea-babies” are nervous, and rightfully so. The last beings who lived on land enslaved the mer-people and nearly destroyed their population. A ha! Now I know where I am! The Stars are Ours takes place a few hundred years before Star Born, which I read a while ago! Star Born was wonderful, and now that I’ve read the first book, the glossed over scenes in Star Born make a lot more sense. That said, I think you can read these two books in either order and have a highly enjoyable time. 2 Responses to "The Stars are Ours! 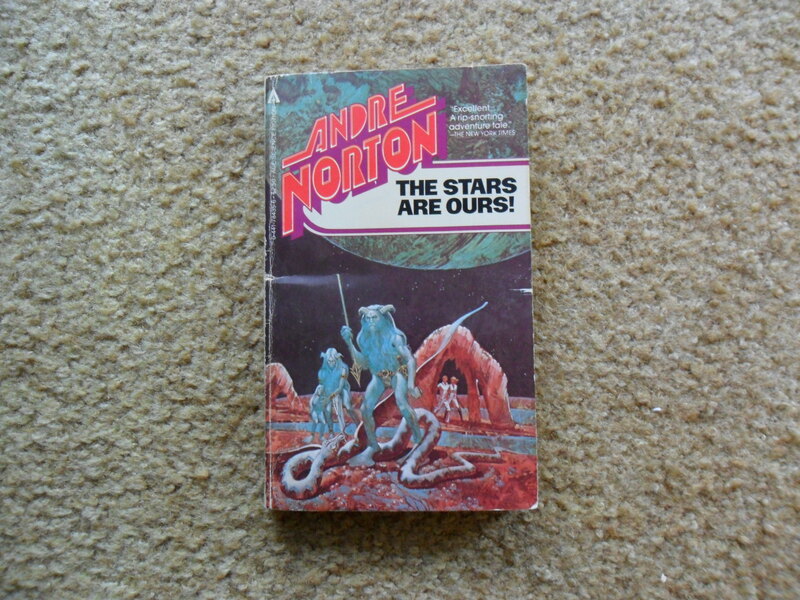 by Andre Norton"
I’ve read woefully few Norton novels to my shame, even though I really enjoyed those I read. Great review and I just wanted to say I really enjoy this series of looks at vintage SF!